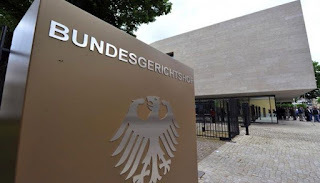 Via Katfriend Mathias Schindler (Office of MEP Julia Reda) comes the news that today Germany's Federal Court of Justice (Bundesgerichtshof - BGH) has referred a new copyright case to the Court of Justice of the European Union: I ZR 228/15 - Reformistischer Aufbruch. This is the third copyright reference from the BGH in less than two months: last month, in fact, this court referred the (long-running) Metall auf Metall case, and the Afghanistan Papiere case [both reported here]. According to the relevant press release (and its Google Translate translation), similarly to the two other references mentioned above, also this new case seeks guidance on – among other things – the interplay between copyright protection and the protection of third-party rights and freedoms (including freedom of the press), as well as the proper interpretation of relevant exceptions in the InfoSoc Directive – in this case, news reporting and quotation within, respectively, Article 5(3)(c) and (d) of the InfoSoc Directive. This new reference has been made in the context of proceedings brought by a German politician who, in 1988, authored a book about “sexual acts of adults with children”. The publisher apparently edited the manuscript without the author's consent and the resulting publication was, according to the author, a distortion of his views. The publisher also released a press report on its own portal to support its view that the original manuscripts had not been distorted. To this end, the publisher included a link that allowed users to download both the original manuscript and the resulting publication. No link to the author’s website was provided. The author submitted that all this amounted to copyright infringement, and brought proceedings against the publisher, being successful at both first instance and on appeal. The case eventually reached the BGH, which has now decided to stay the proceedings and make a reference to the CJEU. Although the press release does not contain the exact questions referred, it appears that the core of the reference, which – as also noted by the BGH – is similar to the Afghanistan Papiere case – concerns the interpretation of the notions of ‘news reporting’ and ‘quotation’ within Article 5(3) of the InfoSoc Directive. With particular regard to ‘quotation’, the core issue seems to be – by reading the press release – whether this exception requires the quotation to be an unaltered reproduction of part of the original, or also allows the reproduction not to be identical. This question is a very intriguing one, and the answer may be anything but straightforward. There is no need to say that the resulting outcome will have a significant impact on the scope of the EU quotation exception and - with it - national quotation exceptions. Yesterday Advocate General (AG) Wahl issued his Opinion in Coty Germany GmbH v Parfümerie Akzente GmbH, C‑230/16 [the Opinion has already received a thorough and interesting commentary by leading competition law blog Chillin’Competition]. This is a reference for a preliminary ruling from the Higher Regional Court, Frankfurt am Main (Germany), seeking guidance from the Court of Justice of the European Union (CJEU) on how to interpret relevation competition law provisions [Article 101(1) TFEU and of Article 4(b) and (c) of Regulation (EU) No 330/2010] in the context of selective distribution agreements. This case is linked to, on the one hand, the increasing popularity of electronic marketplaces over which producers have no influence [eg Amazon, eBay] and, on the other hand, the question whether a supplier may prohibit authorized resellers from making use of non-authorized third undertakings over fear that the relevant products would otherwise lose or risk losing their ‘luxury’ image. As readers may imagine, the latter is indeed the core issue in the background national proceedings, brought by Coty Germany [an undertaking that supplies luxury goods and is certainly not new to having its cases referred to the CJEU: eg here, here, and here] against one of its authorized distributors (Parfümerie Akzente), which has been selling Coty’s products for years both at (Coty-approved) brick-and-mortar locations and online (through amazon.de). When Coty sought to extend the control that it has over physical retail to the online sphere, Parfümerie Akzente refused. As a result, litigation ensued. In 2014 the first instance court sided with Parfümerie Akzente, and held that the objective of preserving a prestige brand image does not justify the introduction of a selective distribution system which by definition restricts competition. 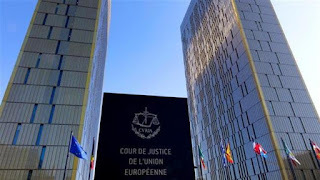 The decision was appealed to the Higher Regional Court, which was unsure whether the one at first instance was a correct application of CJEU case law, notably the 2011 judgment in Pierre Fabre Dermo-Cosmétique. The court thus decided to stay the proceedings and refer the case to the CJEU. AG Wahl noted at the outset that the decision in Pierre Fabre Dermo-Cosmétique has been subject to divergent interpretations by national competition authorities and courts: this case is therefore an opportunity for the CJEU to clarify the meaning and scope of its earlier jurisprudence. According to the AG, the interpretation given at first instance in the background national proceedings is not the correct one: the seller of luxury products is not prevented at the outset from requiring its authorized retailers to sell products at certain conditions and locations – whether offline (brick-and-mortar shops) or online. This is because price competition is not the only form of effective competition [para 33], and – indeed – “it is on the basis of that premise that selective distribution systems [based on qualitative criteria] should be seen” [para 34]. The CJEU has recognized the legality of selective distribution systems based on qualitative yet objective criteria (determined uniformly and applied in a non-discriminatory fashion – including preserving a certain product image) since the seminal decision in Metro. “[t]hey constitute a factor that stimulates competition between suppliers of branded goods, namely inter-brand competition, in that they allow manufacturers to organise efficiently the distribution of their goods and satisfy consumers.” [para 42; on intra-brand competition, see para 44]. 1. It must be established that the properties of the product necessitate a selective distribution system, in the sense that such a system constitutes a legitimate requirement, having regard to the nature of the products concerned, and in particular their high quality or highly technical nature, in order to preserve their quality and to ensure that they are correctly used. 2. Resellers must be chosen on the basis of objective criteria of a qualitative nature which are determined uniformly for all potential resellers and applied in a non-discriminatory manner. 3. The criteria defined must not go beyond what is necessary. The Opinion of AG Wahl appears both correct and sensible, including from an IP perspective [but see here for a critical take]. Readers will remember in particular that in Dior the CJEU linked the grant of a licence in the context of a distribution agreement concerning luxury products (in that case, "corsetry goods") to the exercise of Dior’s trade mark rights, notably the right to put relevant goods into circulation for the first time. 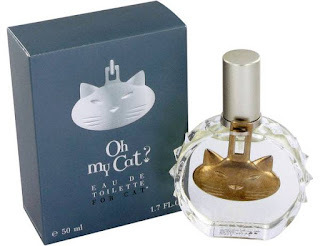 In Coty Prestige the CJEU noted that the exclusive nature of trade mark rights means that any unauthorized use of a trade mark may amount to an infringement. Let’s see if now the CJEU also agrees with the AG. Stay tuned! 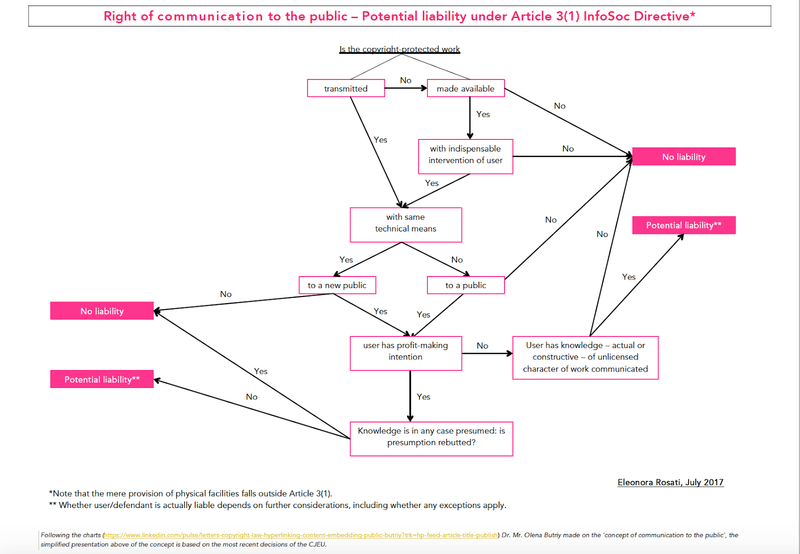 The right of communication to the public under Article 3(1) of the InfoSoc Directive has been subject to several (nearly 20) references for a preliminary ruling to the Court of Justice of the European Union (CJEU). Over time, this exclusive right has become increasingly complex, and yet absolutely topical to online exploitation of works and enforcement of relevant copyrights. Lacking a definition of the notion of ‘communication to the public’, the CJEU has sought to determine the meaning and scope of this concept in light of the objectives pursued by the InfoSoc Directive, notably to ensure a high level of protection of intellectual property (Recital 24) and for authors. In its rich body of case law on Article 3(1) of the InfoSoc Directive, the CJEU has consistently stated that the essential requirements of Article 3(1) are an ‘act of communication’, directed to a ‘public’. In addition, the CJEU has also highlighted the importance of considering additional criteria which are not autonomous and are interdependent, and may – in different situations – be present to widely varying degrees. Such criteria must be applied both individually and in their interaction with one another. So, what questions should you ask yourself when addressing communication to the public issues? 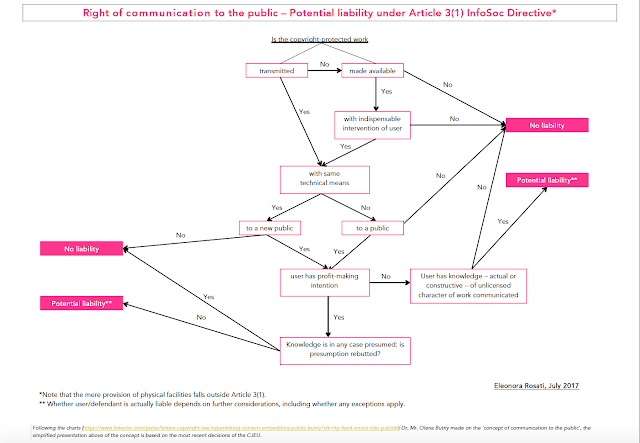 As part of my student materials [see here] and inspired by mandatory summer reading, ie magazines and their relevant quizzes, I have created a little - simplified - chart on the right of communication to the public post-Ziggo [C-610/15, also known as The Pirate Bay case]. If you are interested in a more extensive discussion of the requirements under Article 3(1) of the InfoSoc Directive, see this recent paper of mine here [presented here]. The chart can be also downloaded in PDF here. Any feedback and comments are very welcome! 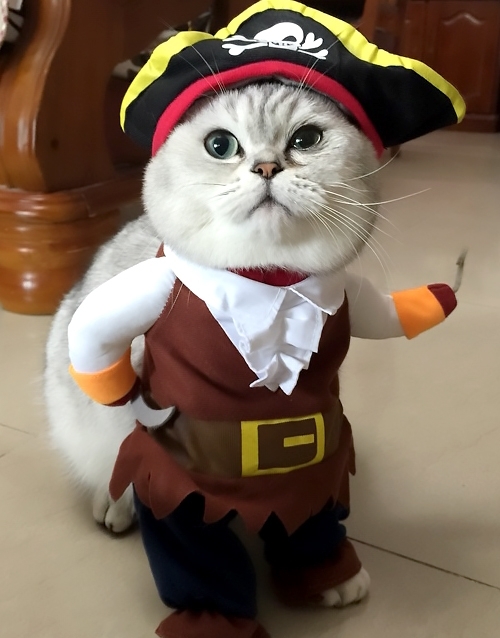 As this blog reported, on 14 June last the Court of Justice of the European Union (CJEU) issued its much-awaited judgment in Stichting Brein v Ziggo BV and XS4All Internet BV, C-610/15 (the ‘Pirate Bay’ case). There, the Court developed further its construction of the right of communication to the public within Article 3(1) of the InfoSoc Directive, and clarified under what conditions the operators of an unlicensed online file-sharing platform are liable for copyright infringement. The CJEU judgment builds upon the earlier Opinion of Advocate General (AG) Szpunar in the same case [reported here], yet goes beyond it. This is notably so with regard to the consideration of the subjective element (knowledge) of the operators of an online platform making available copyright content. Unlike AG Szpunar, the Court did not refer liability only to situations in which the operators of an online platform have acquired actual knowledge of third-party infringements, but also included situations of constructive knowledge (‘could not be unaware’) and, possibly, even more. 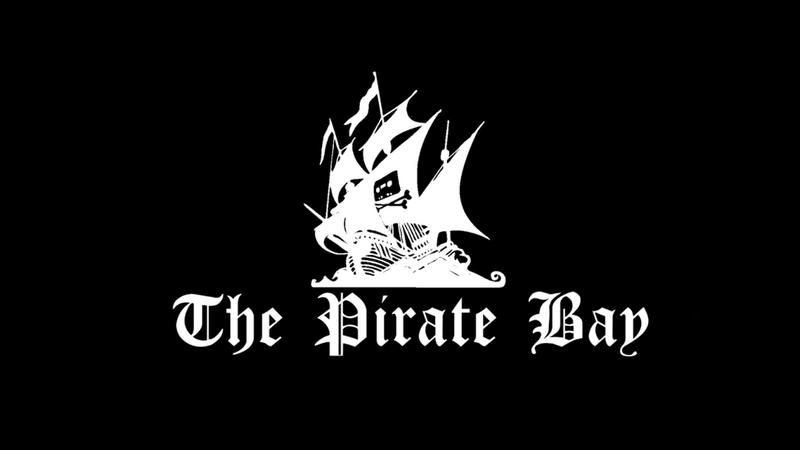 Overall, the CJEU decision is not limited to egregious scenarios like the one of The Pirate Bay: the Court’s findings are applicable to different types of online platforms, as well as operators with different degrees of knowledge of infringements committed by users of their services. In my view the judgment is expected to have substantial implications for future cases (including at the level of individual Member States), and overall prompts a broader reflection on issues such as the interplay between primary and secondary liability for copyright infringement, applicability of the safe harbour regime within the E-Commerce Directive, as well as the current EU copyright reform debate, notably the so called value gap proposal within Article 13 of the draft Directive on Copyright in the Digital Single Market. Further to a request of the International Federation of the Phonographic Industry (IFPI), I prepared a paper that would explore the possible implications of the judgment. The paper is going to be published as an article in the European Intellectual Property Review later this year. In the meantime, you can find a pre-edited version here. Is there such thing as digital exhaustion under the InfoSoc Directive? This is a topic that this blog has followed for a while [latest installment here]; the practical implications relate to the possibility of having second-hand markets for digital copies of copyright content, e.g. e-books, videogames, audiobooks, etc. "The distribution right shall not be exhausted within the Community in respect of the original or copies of the work, except where the first sale or other transfer of ownership in the Community of that object is made by the rightholder or with his consent." Things are complicated further by the wording of Recital 28 and 29 in the preamble to the directive, as well as the fact that - unlike the right of distribution - the right of communication to the public (i.e. 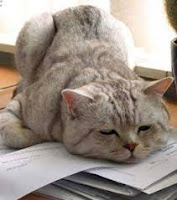 the key right when it comes to online exploitation and availability of content) is not subject to exhaustion as per Article 3(3). Readers may remember that the question of digital exhaustion has arisen in a number of Member States, especially in the aftermath of the controversial UsedSoft decision by which the CJEU held that the Software Directive - which is lex specialis in relation to the InfoSoc Directive [this concept was reiterated in Nintendo, on which see Katposts here] - envisages digital exhaustion in relation to software. 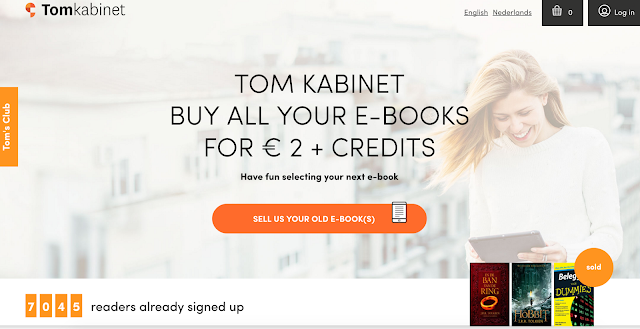 While in 2014 the Court of Appeal of Hamm (Germany) dismissed the idea that exhaustion could apply to audiobooks [here], in the same year the Amsterdam District Court (Netherlands) suggested otherwise in a case concerning second-hand e-book trader Tom Kabinet [here]. As this blog anticipated back in 2014, the Dutch Tom Kabinet case might be one to head to Luxembourg. Now, after little less than three years, all this is becoming real. 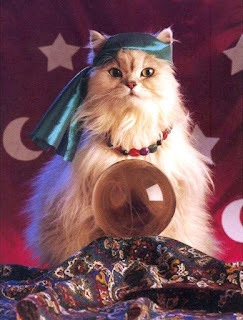 Through anonymous Katfriend, expert in all things Dutch IP, @TreatyNotifier comes the news that the Tom Kabinet case is indeed just about to be referred. 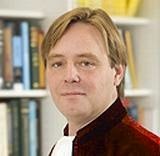 In a decision published two days ago the Rechtbank Den Haag (Court of The Hague) held that Tom Kabinet is not liable for unauthorised acts of communication to the public under the Dutch equivalent of Article 3(1) of the InfoSoc Directive. However, it is unclear whether it could invoke the digital exhaustion of the right of distribution in relation to its e-book trade. 1. Is Article 4(1) of the InfoSoc Directive to be interpreted as meaning that "any form of distribution to the public of the original of their works or of copies thereof by sale or otherwise" as intended there to be understood as remotely through downloading for use for an unlimited time making available for use of e-books (i.e. digital copies of copyright protected books) at a price through which the copyright holder receives a remuneration corresponding to the economic value of the copy of the work of which he is the proprietor? 2. If Question 1 is to be answered in the affirmative, is the distribution right with respect to the original or copies of a work as referred to in Article 4 (2) of the InfoSoc Directive exhausted in the Union when the first sale or other transfer of ownership of that material, here including making available e-books (i.e. digital copies of copyright protected books) remotely through downloading for use for unlimited time at a price through which the copyright holder receives a remuneration corresponding to the economic value of the copy of the work of which he is the proprietor, in the Union is made by the rightholder or with his consent? 3. Should Article 2 of the InfoSoc Directive be interpreted as meaning that a lawful transfer between successive acquirers of the copy of which the distribution right has been exhausted means consent for the acts of reproduction referred to in that article, in so far as those acts of reproduction are necessary for the lawful use of that copy? 4. Should Article 5 of the InfoSoc Directive be interpreted as meaning that the copyright holder can no longer object to acts of reproduction which are required for a legitimate transfer between successive acquirers of the copy in respect of which the distribution right has been exhausted? The parties to the proceedings have until 30 August to react to the drafting of the questions. After that date (and without further deliberation) the questions will be finalised (in a new intermediate decision which will be published on rechtspraak.nl) and sent to Luxembourg sometime in autumn 2017. What will the CJEU say? At paragraph 54 of his Opinion in VOB, C-174/15, Advocate General Szpunar suggested that existing CJEU case law - notably the decision in Allposters, C-419/13 [Katposts here - that is where the CJEU held that exhaustion only applies to the tangible support of a work] "neither calls into question nor limits in any way the conclusions which follow from the Usedsoft judgment." This, together with: (1) the fact that the (completely offline) Allposters case suggested that exhaustion only applies to the corpus mechanicum (tangible support) of a work, and (2) the language of Recitals 28 and 29 - might be a hint towards a response of the CJEU in the sense of denying the existence of digital exhaustion under the InfoSoc Directive. In any case, as I suggested here, the question of whether there is or there is not digital exhaustion might be a self-resolving one, in the sense that it might become eventually irrelevant in the context of creative industries and content providers increasingly experimenting with and relying on models – notably streaming – where the actual possession of a ‘physical copy’ by the end-consumer is an anomaly, rather than the rule. But let's wait and see!